Spring Cleaning? Start with your feet! Spring is here (we hope) in Wisconsin! Spring Cleaning! Start with your feet! It is as easy as 1-2-3. One of the first things I am looking forward to is to ditch the hiking boots & socks & slip on my sandals! My feet are so looking forward to this! They have been confined in wool socks & clunky boots for a long Wisconsin winter. And they are dry, rough & not so happy. How do I prepare them for the spring & summer sandal season??? With a Gypsy Moon Foot SPA!!! Citrus Sugar Scrub treatment followed by Peppermint Foot Balm massage. Step 2 Cleanse & exfoliate with citrus or spicy sugar scrub– in the sink or shower. Step 3 Finish with a peppermint foot balm massage for cooling & healing action. aaahhhh…smooth, silky & happy feet emerge! Ready for spring & summer sandal weather! – like hands, elbows & knees and even your whole body!!! organic sugar– Fair Trade organic cane sugar. (Sea salt is good too, but it can irritate open skin). sesame oil– contains natural antioxidants making it a stable oil for body care. It is a medium weight oil, high in Vit E, is warming and good for dry skin. It also has natural sunscreen properties. shea butter*– Comes from the shea tree in West & Central Africa. High in Vit A & E, it is excellent in treating dry, aged & cracked skin. It is very penetrating & can also help heal soreness & bruising. tangerine, grapefruit EO’s– lift the spirit, relax muscles, invigorating. and has many other therapeutic properties for body & spirit. clove EO– antiseptic, relieves sore muscles and smells amazing. * we purchase pure, unrefined Fair Trade shea butter from Agbanga Karite in Olympia, WA. www.agbangakarite.com. ** we source our pure essential oils from mountainroseherbs.com in Oregon. They disclose where they get their products and if they are sustainably harvested & produced, fair trade, etc. 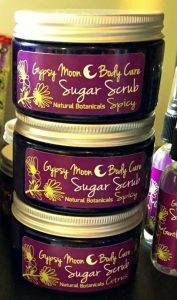 Use this scrub 1-2x a week with warm water- spot treating rough areas in the shower or use the sink or a bucket for your feet. Use in the shower if you are going to scrub your whole body. Massage the sugars onto your skin, rinsing with warm water when you are ready. Be mindful of slippery floors if you are in the shower or scrubbing your feet. They will be oily. Your skin will feel smooth & silky afterwards- and be saying Thank You, Thank You! You may be tempted to stop here. But….I advise you to go on to apply the Peppermint Foot Balm for the full Spa treatment. Gypsy Moon Peppermint Foot Balm – soothing relief for tired, dry & cracked feet. YES! jojoba oil– a liquid plant wax that closely resembles human sebum. It is a protective, emollient and is wonderful for dry, aged & damaged skin. unrefined Coconut Oil– cools, moisturizes & protects the skin. It has antibacterial properties and of course smells great! peppermint essential oil– stimulating, cleansing, cooling & refreshing. Your feet will love how invigorating it is, helping your feet recover from fatigue & muscle aches. eucalyptus essential oil– cooling, refreshing & deodorizing. Also antiseptic for wounds & insect bites. lavender– helps reduce inflammation, relieve pain, relaxing, regenerates skin. Apply Foot Balm after your Sugar Scrub treatment or on it’s own (nightly). Kick back, have a friend give you a foot massage- or treat yourself – DIY! Let the oils absorb while you set your pampered feet up on a footstool covered with a towel. Or slip on some socks & head to bed. Your feet will feel the invigorating yet relaxing minty oils & be soft & refreshed when you wake up. Repeat once or twice a week during the spring & your feet will feel & look great! …Next? maybe choose a new spring color of nail polish?? ?